The Johnny Mullagh XI team finished runners up for the second consecutive year at the annual 2010 Globalwater Willowfest Cricket Championships in Mildura. The Johnny Mullagh XI was defeated in the Working Man’s Club B-Grade division final by 24 runs against a local team from Coomealla-Wentworth. 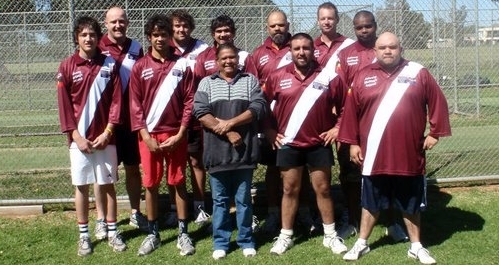 The Johnny Mullagh XI is now an invitational side featuring Aboriginal cricketers from the South West Indigenous Cricket Association (SWICA) as well as several non-Indigenous players who were invited to join the side for the Willowfest Championships. Four non-Indigenous cricketers from the region and Melbourne had bolstered the side with batting, bowling, fielding and wicket keeping strength. The four guest cricketers were Jung Tigers CC veteran opening bowler David Puls, promising Homers CC wicket-keeper/batsman Dylan Young, Heywood CC A-grade captain Mark Jones and all-rounder Marcus Curnow, from the Footscray area and Cricket Victoria. SWICA founder Uncle Wayne ‘Swisha’ Bell said that the four players had been invited to play to support and strengthen the side and were also important additions due to the unavailability of several SWICA players from the 2010 championships. While there were no individual awards for Johnny Mullagh XI players the side fared better than their debut year in 2010 after winning all four qualifying games and only losing the final by 24 runs. Johnny Mullagh XI players Robbie Marks and Mark Jones enjoyed contesting the Willowfest Wack on the Wednesday evening but failed to qualify for the final. Benny Cooke-Harrison also competed in the Willowfest Fast Bowling competition with a best effort of 114kms per hour, that surprised officials and spectators, bowling in board shorts, sandshoes and without a ‘warm up’! Johnny Mullagh XI captain Robbie Marks thanked all players and sponsors for supporting the team in the 2010 Willowfest campaign. Mr Marks thanks main sponsors the Koorie Justice Unit, Department of Justice, the Aboriginal Community Justice Panels Program, and Drew Heard Buses for once again providing bus transport from Horsham for the week. Mr Marks said that the Johnny Mullagh XI would return for the 2011 Willowfest Championships with a bigger squad to ensure more player rotations over the four days.